This year’s D&G Senior confined tournament attracted a large field with 28 players competing over the 2 days. No ladies events went ahead due to lack of entries but 17 players started the gent’s singles event of the Saturday. With the forecast of rain play got under way at 10.30 but unfortunately was suspended at 1.30pm but all the first round matches were completed with Ben Mckiddie edging past Malcolm McEwen 7-6, 2-6, 10-4, Dan McKiddie beating Chad Lawson 6-1, 7-5, Alex Shearman beating Mark Rogerson 6-1, 6-1, Paul Boardman beating Ben Keal 6-1, 6-0, current holder Colin Dunbar beating Lewis Gilmour 6-4, 6-0, Stephen White beating Kyle Singh 6-2, 6-0, Richie Cunningham beating Mitchell Cowie 6-3, 6-0 & Brian Litster beating Euan McGlynn 6-4, 6-1. An early start was arranged for Sunday to push on with the singles before the doubles got under way. 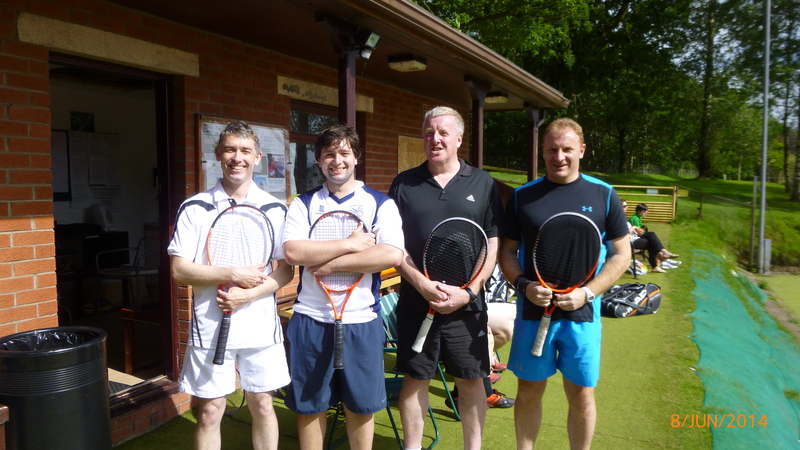 Brian, Colin, Paul and Dan all progressed into the semifinals before the doubles got under way. After the qualifying round were completed the quarter finals took place with defending champions Brian and Fraser brushing past Malcolm and Michael 6-1, 6-1, Graeme and Martin beat Colin and Ruairidh 7-5, 6-7, 10-7, Paul and Stephen beat Chad and Euan 6-3, 6-3 and Dan and Lister bet Ben and Richie 7-6, 6-3. Play then switched back to the singles and the 2001 champion Paul Boardman battle his way into the final with a tight win over Dan McKiddie 4-6, 6-4, 1-7 where he would play against defending champion Colin Dunbar who edge past Brian Litster 3-6, 6-3, 10-2. The doubles semis were just as tight as Dan and Lister eventually overcame Paul and Stephen 6-7, 6-3, 10-3 whilst Brian and Fraser were pushed all the way by Graeme and Martin 6-3, 6-2. With the sun beating down on the courts all 3 finals were played at the same time, Dan and Lister’s game click into place as they put in a great performance to beat defending champions Brian and Fraser 6-2, 6-2, in the singles event both Colin and Paul used all their experience and energy to play out a good final before Colin took the honor’s to regain his title 6-3, 6-2. In the consolation doubles final the young pretenders battled it out in an entertain final, Lewis Gilmour and Alex Shearman beat Euan McGlynn and Chad Lawson 6-3, 6-2 to complete a weekend of play. Thanks goes to all who helped out on the day and to Molplant Construction for sponsoring the event and to Scott Beveridge Plumbing for sponsoring the match balls. The Tennis D&G County Confined Tournament for 2011 takes place on Sat 11th & Sun 12th June 2011 at Dalbeattie Tennis Club, Coliston Park, Dalbeattie. Tennis Dumfries & Galloway presents the 2010 Tennis Dumfries & Galloway Junior Tennis championships for 18 & under, 16 & under, 14 & under, 12 & under and 10 & under boys & girls singles. The matches take place at the club on Friday 18th June 2010 at 6.00 p.m and Saturday 19th June 2010 from 9.00 a.m. The dates are Friday 18th June 2010 at 6.00 p.m. Saturday 19th June 2010 at 9.00 a.m. The venue is Dumfries Tennis Club which is located within the grounds of Dumfries Sports Club on the Nunholm Road and the courts are artificial grass. The closing date for entries is Tuesday 15th June 2010 and they must be sent to Mr Geoff Legg, Kirkbank, Glenlochar, Castle Douglas, DG7 2LR or email: geoff_legg@ yahoo.co.uk . The last round of the Dumfries and Galloway Junior league matches takes place this Saturday, the 22nd August, and the teams are converging on Nunholm. The courts are booked from 10 – 4 and the Dumfries Tennis Club junior team is taking part. Held last month at the Dumfries Sports Club, for the first time this tournament started on a Friday night as there was such a large entry with players from across the region taking part. 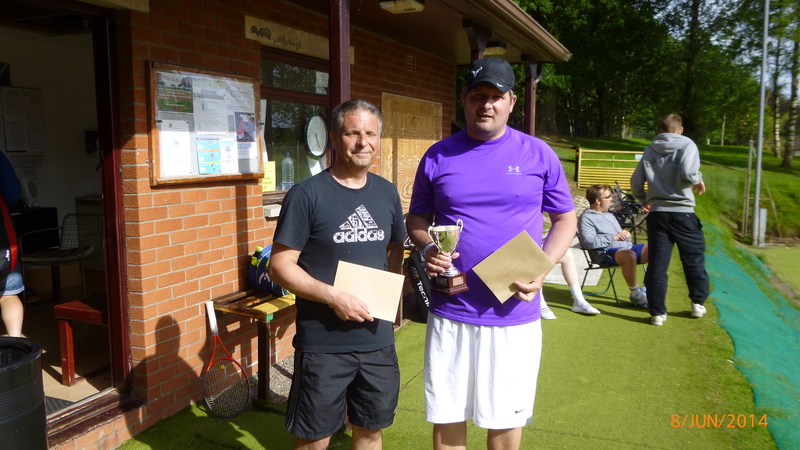 As always the tournament was played in a great atmosphere with some exceptional play on the Nunholm courts. 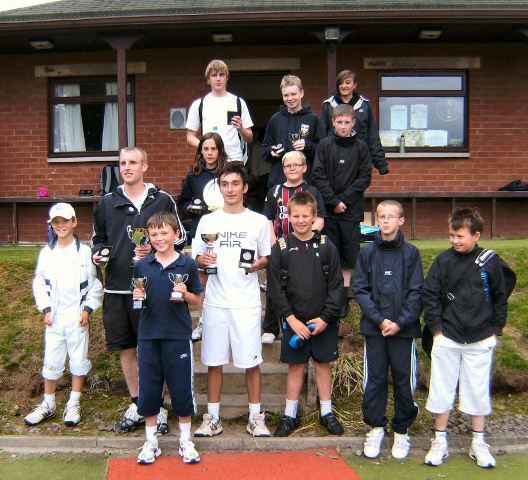 The under 10 Boys singles final saw a strong performance from the club’s Alex Shearman winning 5-1against Callum Kerr. One of the most exciting matches of the day was the under 12 Boys singles final between two from Nunholm, Alex Shearman and Sam Copeland. With the boys tied at one set each they played a very close deciding tie break with Alex coming out on top 1-5, 5-4, 10-8. The under 14 singles was contested by two more from the club, Duncan Muir and Sophie Robinson. Duncan showed the improvement he has made to take the title 6-3, 6-0. 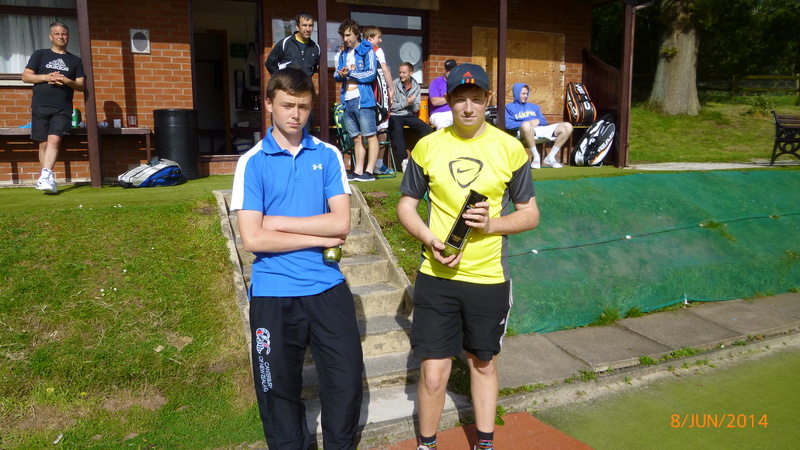 For the third year in a row the under 16 boy’s singles was between Sergio Meola and Jordan Kerr. However this time there was no home win as Sergio was too strong for Jordan winning 6-0, 6-0. This year the under 18 boys singles final was between Jack Copeland and Sergio Meola. Considering he had been at his school prom the night before Jack gave a strong performance winning 7- 5, 6 – 3 to claim another title for Dumfries Tennis Club. The under 12 girls final was between Rhona Park and Nicole McDonald with Rhona winning 5-1, 5-1. In the under 16 girls Sophie Robinson came through very strongly against Blythe Aitken to win 8-0.